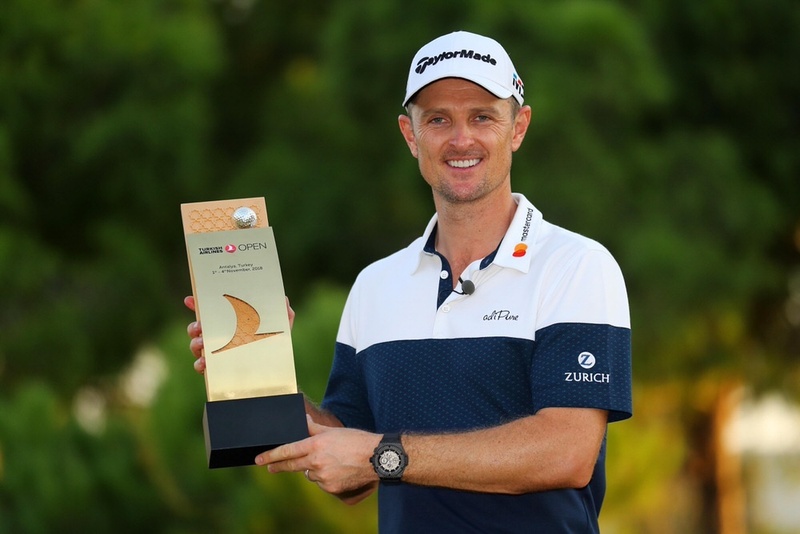 Winning majors doesn’t make you immune to Sunday afternoon pressure but it worked out in the end for Justin Rose as he retained the Turkish Airlines Open after a nerve-tingling playoff and returned to world No 1. As Padraig Harrington’s bogey-bogey finish meant failed to qualify by right for the Nedbank Golf Challenge and he must use an invitation to play for non-official money, former US Open champion Rose (38) kept just cool enough to edge out China’s Haotong Li in sudden-death. Rose erased Li’s three-shot overnight lead after ten holes, setting up a tense battle down the stretch and looked set to canter to victory when he birdied the par-three 14th to go two ahead. But after Li spectacularly eagled the 15th from just two feet to draw level, Rose birdied the 16th to lead by one with two holes to go only to three putt the 17th to go the last tied for the lead again. He failed to take advantage of a three-putt bogey by Li at the 18th, however, bunkering his approach before lipping out from six feet for victory to card a 68 to Li’s 71 and leave them tied on 17-under par. Returning to the 18th in sudden-death, Rose missed from 15 feet for birdie and watched Li three-putt again, knocking his 10 footer for victory three-feet past before missing the return. “Obviously I do have to spare a thought for Haotong,” said Rose who cannot catch leader Francesco Molinari in the Race to Dubai despite moving up to third behind Tommy Fleewood after pocketing €1.02 million. Rose was doubly determined to win the playoff and complete his first successful title defence having lost the PGA Tour’s BMW Championship to Keegan Bradley in a playoff when going to world No 1 for the first time. There was no happy ending for three-time major winner Harrington, however, who looked set to qualify by right for this week’s Nedbank Golf Challenge at Sun City when he went to the turn in three under to leave his fate in his hands. But knowing he needed a solid finish to make it to Sun City on merit, he made a triple bogey seven after two visits to the water at the 10th, and then followed a birdie at the 12th with a nervy bogey-bogey finish that included a visit to water at the 18th. “I have to got to say, and I am being honest about this, but I would hate to be a tour pro playing for his card every day,” confessed Harrington, who shot 72 to tie for 35th on six-under (€40,949) before jetting off to play on an invitation in Sun City. “It’s so annoying. I don’t mind playing to win a tournament but it’s really hard to play when you are trying not to make a mistake. “It’s just horrible. It felt horrible. I played great for three rounds, and today I putted well and scrambled great but you never would want to be hanging into a position as it’s not an easy thing to do, to be defending. Shane Lowry finished tied for 14th on 11-under par after a closing 68, picking up € 87,851. And while he wasn’t at his best off the tee, he is upbeat about this week’s Nedbank Golf Challenge and the season-ending DP World Tour Championship as he bids to make the top 30 in the Race to Dubai who qualify for The Open and edge closer to making the world’s top 50 again by March. "It's an alright week considering how I feel like I played,” said Lowry, who moves up to 41st in the Race to Dubai I didn't hole anything and I felt I wasn't 100 percent off the tee. Paul Dunne tied for 18th, one stroke behind Lowry on 10-under after a 70 after doing well to make bogey from 10 feet at the last after finding the water hazard left off the tee. “It’s really important to have defended a title. It's taken me a long time to do it. Maybe I haven't won enough tournaments to give myself enough opportunities to defend, but this golf course obviously suits my eye, and when you do find a golf course that does suit your eyes, you feel like you should give yourself opportunities to win there, but to do it back-to-back is very special. “A tough day for me honestly and I holed a couple of chances, but not until the end, the first playoff, I saw that ball definitely go in, but a little bit too much.